My semester is over soon. Like, very soon. I have two weeks left until I'm pretty much completely free. That means that I've been day-dreaming about all the books I want to read this summer for a month or so, aka. ever since the end of the semester came in sight. 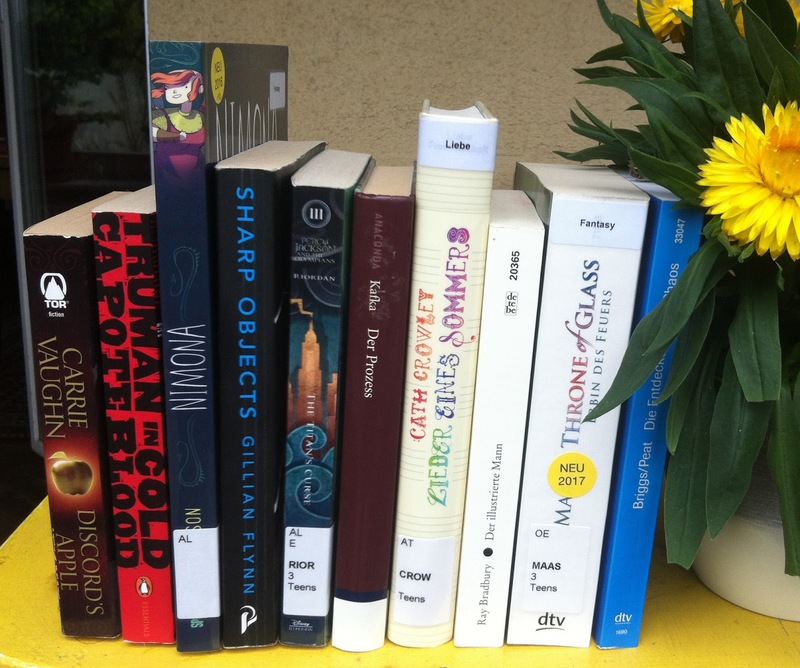 Today, I thought I'd share some of the books I hope to read this summer with you. Generally, I want to finish as many of the series I've started as possible. The libraries around town currently have the third (this) and the fourth of the Throne of Glass books available and I hope to read both of those this summer. Again, this goes with the finishing series I've started thing. Honestly, I don't think Percy Jackson and the Olympians is going to be a problem at all seeing as I'm starting to really look forward to reading all of the Riordan books. I've only ever read one book by Gillian Flynn and I desperately need to remedy that. Moreover, I've heard great things about Sharp Object and I almost can't wait. A Graphic Novel which I've heard fantastic things about. It doesn't take much to convince me to read a Graphic Novel but this one really promises to be quite the blast. Apart from that, there are a lot more books I hope to read this summer. I'm just going to stop mentioning that I've heard "great things" about book here because I heard "great things" about pretty much all of these books. But, honestly, I hardly know anything about this book – which is how I like to go into books. Still, I'm really looking forward to this one (it's been lying around in my room but I didn't read it because I don't like carrying around hardcovers and I always take the books I'm currently reading to uni so... yeah, I had/have to wait until the end of the semester). Again, one of those highly anticipated books of mine which are hardcover and I, therefore, haven't read yet. Apparently, it's a retelling about Vlad the Impaler but Vlad is a girl and I really don't know anything about this book but people tell me it's great and I like reading things that are great. A girl trying to keep the Dead in their archives. If that doesn't sell it: Victoria Schwab wrote it. I need no other reason to read a book. Well, actually I've already listened to an audiobook of this but I've been wanting to also read it for a while – and read it in English. Hopefully I'll have my way this summer. This is Wolters', or rather Devon's because he's a friend of mine and it sounds quite strange to call a friend by their surname, debut novel and this Friday (the 26th of May) it finally hits... well, it doesn't actually hit any shelves in physical bookstores but it does hit the virtual shelves of online-bookstores. And it definitely will hit my shelf which isn't a bookstore but it does have a lot of books on it. I have no idea what it is about but I know Devon's style of writing and telling stories and I really like those, hence, I'm terribly exited – for him, naturally, and for myself, egoistically. It's Sci-Fi/Fantasy, I think? I also think it might be a thriller of some sort or other, maybe? The things I definitely know are: I've been avoiding all information about it and I'm very excited to dive into it. Ever since I've read the first book of this series (which actually really is anything but long ago and certainly not as long as I remember it to be, however, studying makes the time feel longer) I've been longing for the next one. Hopefully, it won't take long at all until I'll be able to devour this. I started reading this one or two years ago but only made it about 100 pages before I kinda just put it away and started reading something else? It wasn't bad but it didn't hold my attention at the time and I really want to read it properly (because Ursula Le Guin). My mother owns this book and I think I borrowed (or stole) it five years or so ago because it looked so cool and I really liked the name. However, my English was still kinda terrible five years ago so I postponed reading it until … well, this summer hopefully. I kind of picked this up on a whim because I thought it was pretty and I liked the name (there definitely is a pattern in my book-picking) but I haven't gotten round to reading it yet (again: see hardcover explanation above). I've already mentioned the third book but, because I'm really looking forward to these, I also want to mention the fourth and fifth one. I'm so excited already! My library finally also has the last book in this series and I really hope I'll be able to finish it this summer. I'm not particularly excited about this book but I am excited about the prospect of finishing a series. I read the first three Sherlock Holmes stories and it's due time I've read the rest. I've really wanted to read a Morgan Matson for a while but I've decided that I'll finally do it this summer! Hopefully, I'll love it just as much as everyone else and become a Matson-addict (apparently, that's a pretty neat thing to be). This is the oldest unfinished book on my shelves. I received it when I was 12 or so years old and I started reading it but I simply didn't manage to go beyond the first couple of hundred pages – I'm pretty sure I read at least 300 pages but it's been too long to say for certain. I think my time has come to remedy the past and move on from my current place of constant shame. Aaand that's it! No more books for this list (obviously, I have a seemingly infinite tbr-list and I'm hoping to read a lot more than these but they are the books I "most anticipate" or something. If you have any further recommendations (or a summer reading list of your own) do let me know because I'm always eager to discover new books. Have a nice day and happy reading.